drivingandlife: ASTON MARTIN'S SMART V8. SO FAST, IT'S SILLY! 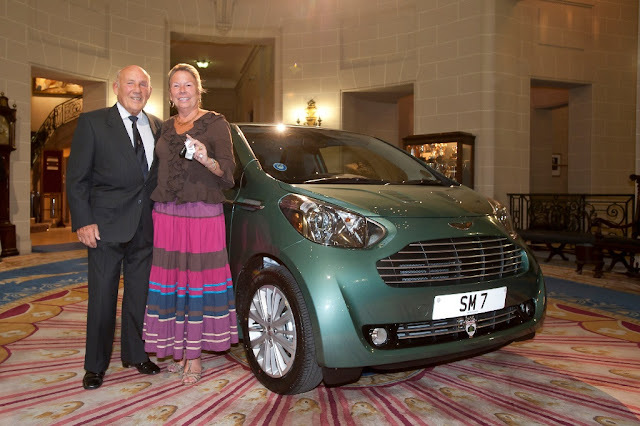 A few years ago when my dear friend Ulrich Bez was Chairman and CEO of Aston Martin, he hatched a plot to use the Toyota iQ (below) as the basis of an Aston Martin which city-living customers could use in busy cities, without getting their GT car out in the traffic. It was a pretty cheeky idea, but quite consistent with Ulrich's unconventional approach to life. Yes, he is a rare breed, an eccentric German. 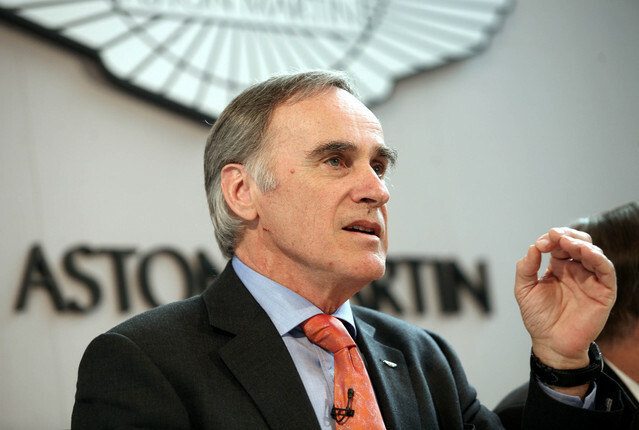 He also figured the plan would help the company’s CAFE (Corporate Average Fuel Economy) fuel economy targets for the USA. I’m not sure how many Aston Martin owners bought the car, named the Cygnet, but my good mate Sir Stirling Moss certainly did. He and Lady Susan used the little car to buzz around London doing errands, and checking on their property investments. I even had a steer on one occasion when I was staying with the Mosses in Mayfair. Over breakfast one morning I consumed the last of the orange juice, and SM coerced me to take the Cygnet, and go to Marks and Spencer, in Oxford Street, to replenish the OJ. 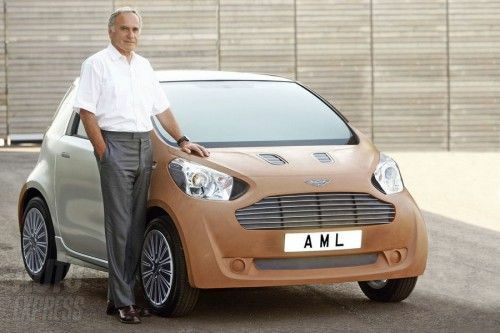 Now, Aston Martin has clearly gone bonkers! 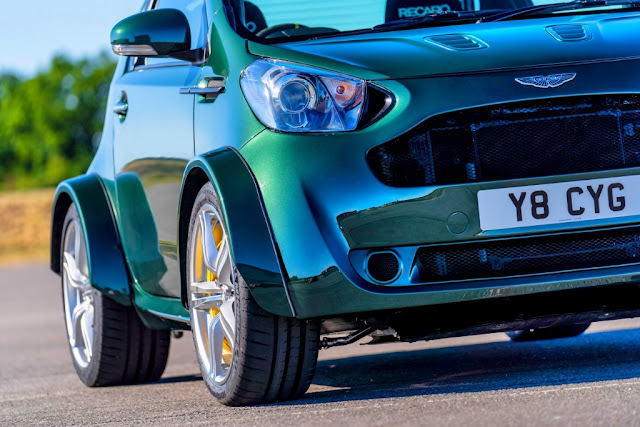 One of its customers approached the company’s new ‘Q division’ (intended to build bespoke Astons) to build him a Cygnet, powered by a Vantage V8 engine. Unsurprisingly, because not only are English engineers slightly eccentric, and a pound’s a pound in any economy, the company got right down to engineering and producing the world’s smallest, road-rocket. 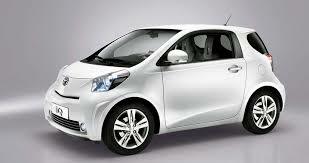 So, here it is, the Cygnet V8. I will reproduce the PR blurb to provide the details, but what a great project! I’ll bet the engineers at ‘Q’ loved every minute of it. 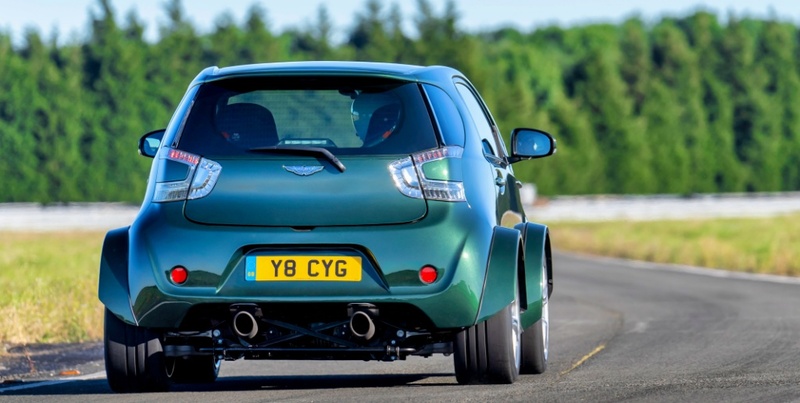 Developed in-house by Aston Martin’s engineers, the starting point for the project was a right-hand drive Cygnet steel body shell and panels. A roll cage was welded to this, becoming an integral part of the chassis in the process, while a new front bulkhead and transmission tunnel were fabricated from sheet metal to accommodate the characterful 4.7-litre naturally aspirated V8 Vantage S powertrain. Subframes and suspension are also derived from the previous generation Vantage, and a steel fuel tank housing has been mounted in the boot area, utilizing every inch of space. Despite all this work, the car remains very recognisably a Cygnet from the outside. The face of the little Aston Martin remains largely untouched, with no extra bulges in the bonnet and just a subtle black mesh for the famous grille. However, there is no disguising the extra width of the wheel arches. In order to accommodate the significantly wider front and rear tracks, beautiful carbon composite flared extensions were made. These also house the new forged, five-spoke, diamond-turned wheels, which have grown from 16 to 19 in diameter. At the rear of the car the distinguishing new feature of the V8 Cygnet are the central twin exhaust pipes. The exhaust is a bespoke system with twin underfloor mufflers and catalytic converters. With relatively short distances involved from manifold to tail pipe the V8 Cygnet has a voice that belies its compact size. 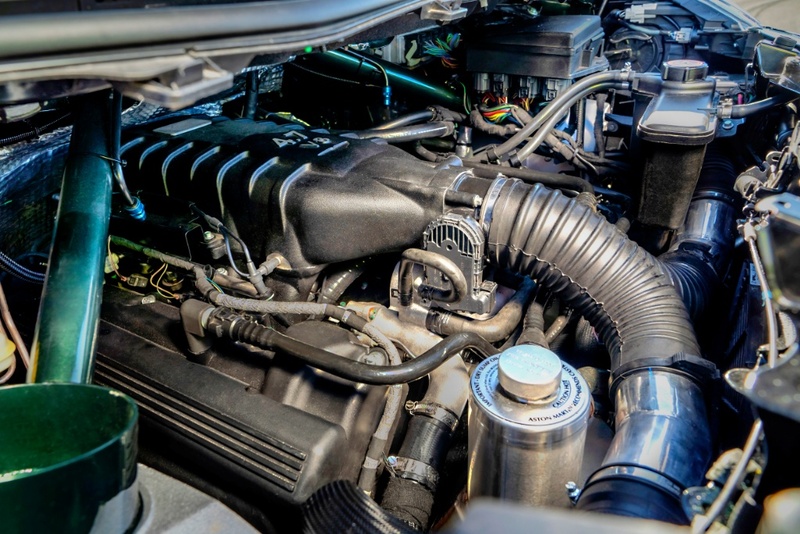 The engine itself is the 4.7-litre, naturally-aspirated V8 that is more usually found beneath the bonnet of the previous-generation Vantage S.
Bespoke intake trunking had to be designed and there are twin conical air filters. There is no sense in which the engine has been neutered for the Cygnet, however, with power and torque figures remaining at 430bhp and 490NM (361lb ft) respectively. The gearbox is also taken from the V8 Vantage S with a seven-speed Sportshift II transmission taking care of the shifting. Power is transferred via a miniature torque tube to the 9.5 rear wheels, which are complemented by 275/35 Bridgestone tyres. Braking is taken care of by 380mm discs clamped by six-piston monoblock calipers at the front, and 330mm discs gripped by four-piston mono block calipers at the rear. The calipers are painted yellow to contrast with the Buckinghamshire green of the bodywork. Most of the remaining parts of the braking system are taken from the V8 Vantage S with ABS and a fixed brake bias valve. 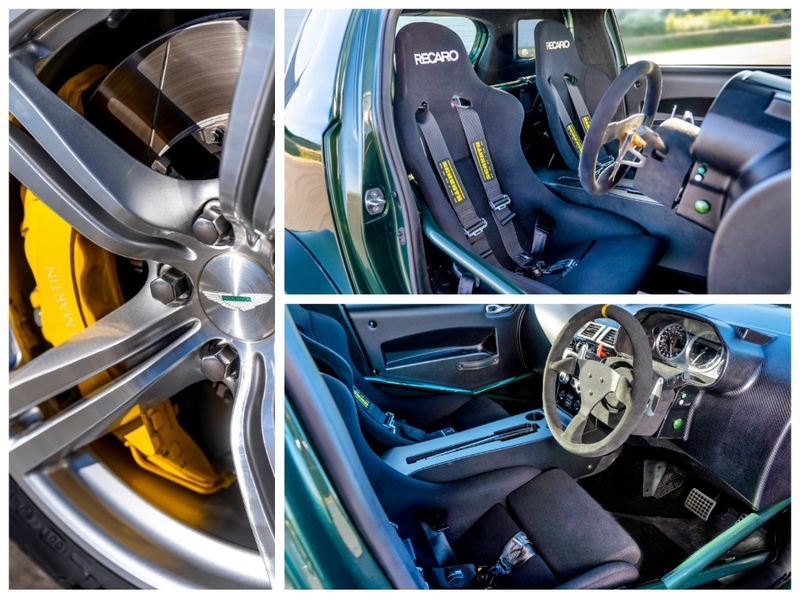 Inside, there is a bespoke brake pedal housed in the V8 Vantage-derived pedal box. The rest of the interior is largely indicative of the fact that this V8 Cygnet could easily be used for competition. In addition to the roll cage there is a fully FIA compliant fire extinguisher system and seating is taken care of by composite, fixed back Recaro bucket seats with four-point harnesses. The alcantara covered steering wheel is removable and behind this sits a bespoke carbon dash with the familiar Vantage instrument cluster. There are, of course, little touches of luxury inside as well, with leather pull straps on the unique carbon door cards and two USB ports alongside the bespoke controls for the air conditioning. Is this crazy, or what? It’s fabulous. Long live British eccentricity!